The Swagger Wagon gains a bit more swag for the current selling season, with the 2013 Toyota Sienna adding standard features across the lineup: By discontinuing the previous year’s 4-cylinder engine, for example, a V6 becomes standard on even the entry model, and the other grades have been enhanced as follows: The 2013 Toyota Sienna LE welcomes a tri-zone automatic climate control system with digital rear controls, the Limited model now benefits from a blind-spot monitor and an acoustic windshield that’s also new on the 2013 Toyota Sienna XLE. Customers can configure the 2013 Toyota Sienna with both the segment’s only all-wheel drive system and seven- or eight-passenger seating, depending on model. The first of which, the 2013 Toyota Sienna L, is a front-wheel-drive choice with room for seven, including a pilot who enjoys a six-way adjustable driver’s seat and a front passenger who gets four-way adjustable seating. The second row of the 2013 Toyota Sienna L features captain’s chairs that tip up and adjust fore and aft for added versatility, while the third row is a 60/40 “Split & Stow” bench. Also standard in the L model: remote keyless entry, an ECO Driving Indicator, LED tail and stop lights, power locks and windows, and upper and lower glove compartments. The 2013 Toyota Sienna LE is offered in either a seven-person all-wheel-drive version or with front-wheel drive and seating for eight, then receives additional standard features like a premium climate system (with air filter), a six-speaker AM/FM/CD/MP3/WMA/USB sound system with Bluetooth technology, easy-clean seat fabric, and remote keyless entry with power-sliding door functionality. Distinct exterior style changes are part of the LE package as well, and include a black grille insert and chrome frame, color-keyed door handles and mirror caps, and black roof rails. 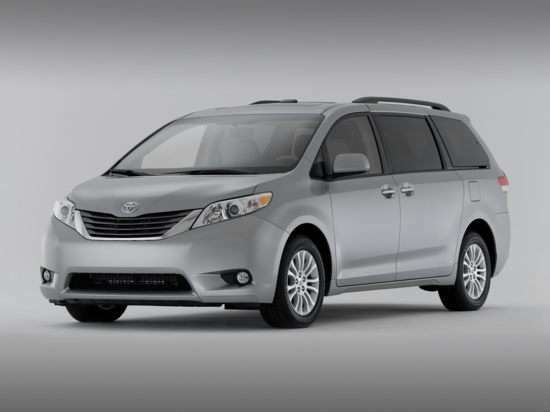 Providing an athletic upgrade for the FWD, eight-passenger configuration is the 2013 Toyota Sienna SE. As expected in any vehicle with a sporting attitude, the SE model wears an aero body kit and rides on a sport-tuned suspension, and it also gets aggressive exterior design enhancements such as a smoked trim for its LED rear lights and projector-beam halogen headlights, a mesh grille insert, chrome-accented exterior door handles, and 19-inch alloy wheels. In addition, the cabin of the 2013 Toyota Sienna SE has been upgraded to feature leatherette seat trim, a multi-function steering wheel wrapped in perforated leather, and exclusive white-backlit instrumentation. A power liftgate is standard, too. For a more traditionally lux experience, the 2013 Toyota Sienna XLE expands on the SE’s premium content with perforated leather front- and second-row seats (including heated driver and front passenger seats), model-exclusive “Optitron” instrumentation, wood-grain-style cabin accents, a gray metallic grille, a power tilt-and-slide moonroof, and unique exterior trim. The 2013 Toyota Sienna XLE can be ordered as either an eight-seat, front-wheel-drive model or in a seven-seat/AWD configuration. The most luxurious member on the 2013 Toyota Sienna roster is the Limited grade. With refined accents and trim on the outside, the Sienna Limited provides a seven-seat cabin paired with front- or all-wheel-drive powertrains, and an up-scale interior enhanced by JBL audio, two-tone leather upholstery, a power-folding third row, and a leather-trimmed steering wheel with wood-grain-style accents and voice-command controls. Finally, it’s all topped off by premium convenience and safety advantages like a blind-spot monitor, rear cross-traffic alert, Toyota’s Smart Key System with push-button start, and the automaker’s Safety Connect suite of emergency services. And keep in mind, more infotainment alternatives await on the options list for the 2013 Toyota Sienna, including navigation, Entune technology, rear- and multi-view camera systems, and rear-seat DVD entertainment center with 16.4-inch “Dual-View” screen. One powertrain is featured throughout the 2013 Toyota Sienna portfolio, pairing a 3.5-liter V6—serving up 266 hp and 245 lb.-ft. of torque—to a six-speed, electronically controlled automatic transmission. The EPA rates the FWD 2013 Toyota Sienna at 18 mpg city/25 mpg highway/21 mpg combined; when ordered with all-wheel drive, the Sienna’s fuel-economy ratings are 16 mpg city/23 mpg highway/19 mpg combined. After being awarded 4 stars for frontal and rollover crash protection, and 5 stars for side crash protection, the 2013 Toyota Sienna finished as a 4-star overall performer in the New Car Assessment Program of the National Highway Traffic Safety Administration (NHTSA). The Insurance Institute for Highway Safety (IIHS) also recognized the Sienna as a Top Safety Pick for the 2013 model year. The 2013 Toyota Sienna offers a full slate of infotainment technologies, highlighted by the Entune suite of mobile apps and data services, all accessed by leveraging a compatible smartphone. Voice-activated touchscreen navigation, a rear-seat entertainment system, and JBL audio components (including a subwoofer) are in the mix as well, and equally impressive is Sienna’s list of driver-assistance measures. Among them: A multi-angle parking camera, blind-spot and rear cross-path alerts, and a one-year complimentary subscription to Toyota Safety Connect, which includes emergency assistance, stolen-vehicle location, roadside assistance, and automatic crash notification.